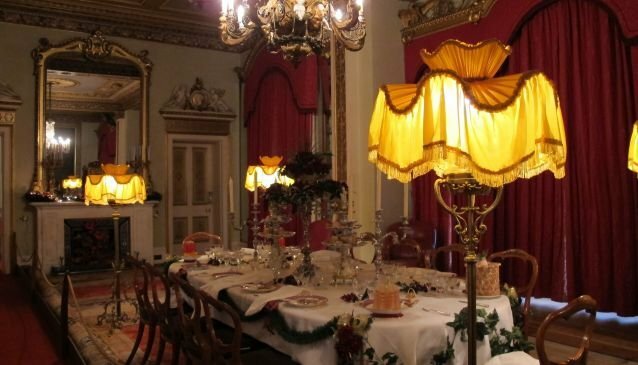 ‘A Victorian Christmas’ at Osborne House has become one of the most popular Christmas events on the Isle of Wight. Queen Victoria adored spending Christmas at Osborne House on the Isle of Wight , with her beloved husband Prince Albert and their nine children in the 1800’s. These days, English Heritage maintains the beautiful royal residence. Every Christmas now, the wonderful A Victorian Christmas event brings the magic of the festive season back to Osborne, allowing us to experience what a royal Christmas was like during Victorian times. This two day English Heritage event is usually the first to bring the spirit of Christmas to the Isle of Wight, being held in November. This year, on the 17th – 18th November 2012, Osborne House was bursting with Christmas cheer and Victorian tradition. There were Victorian side-shows and games, festive food and drink, traditional children’s toys and even an organ grinder. Although the snow was created by a modern day snow machine, the effect was enchanting, with white flakes gently falling onto the real Christmas tree and Victorian street scene below. The large carousel at the front of the very grand house, with its brightly coloured horses and delightful music nearly stole the show. However, the most impressive feature of A Victorian Christmas is of course Osborne House itself. Beautifully decorated with trees and natural Christmas decorations , there was not a plastic reindeer in sight! The dining table was laid with as it would have been on Christmas Day, whilst another room was set up just as it can be seen in a photograph from the time – with the tables set up and ready to be piled high with presents. Of course it would not really have felt like Christmas at Osborne House without Queen Victoria herself wandering around and enjoying the festivities. (Well, an extremely talented version of her anyway!) Dressed just as she would have been, Queen Victoria had a very warm presence and was very welcoming, although of course she was also very self-assured and would put you in your place if necessary. We were honoured that her majesty agreed to be filmed for our video, although she did remind me that of course she didn’t approve of women working! However, she accepted that times have moved on. And finally, no Christmas event would be complete without Father Christmas and his elf. They had bought with them their grotto… which was in fact the grotto of any child’s dreams and certainly one of the best I have seen! Children were lined up outside, excited to meet the jolly fellow. We took lots of photos too - see them on our Facebook page. If you would like to go and see Osborne House for yourself this Christmas, they are running Festive Guided Tours from 21st November 2012 - 6th January 2013. UPDATE Thinking of coming to Christmas at Osborne House in 2013?